The Electronic Data Interchange (EDI) allows the automatic, electronic transmission and reception of purchase orders and invoices to and from your clients. Customer information can be entered and stored and each customer is provided with a unique ID, which cannot be edited. Customer information includes customer id, customer name, address, invoice terms, credit limit, bank information, shipping information and further details. Enters and stores EDI information for unique customers, allowing EDI transactions to occur with greater ease. By using the Customer Item Price, a user can enter special prices for customers or different customer categories for a particular style/item or for a group of item/style. The Customer SKU# and UPC# is also defined for the customer for a particular style, which is required at the time of receiving EDI orders from the customer. The price entered is picked while reading 850.dat file. User can directly receive purchase orders from the EDI Module with the Receive PO feature from the EDI option. This feature allows the 850.dat file to be imported and the purchase order to be received using EDI. Users can specify the file path from where the file is to be imported. Data is taken through EDI and extracted for further processing. Users can make changes to purchase orders that are received through EDI. The Invoice at the sales module is imported to EDI, after the purchase order files are processed and the item is shipped. Invoices that are generated are initiated and allotted with a sequential number (for e.g. E0001). 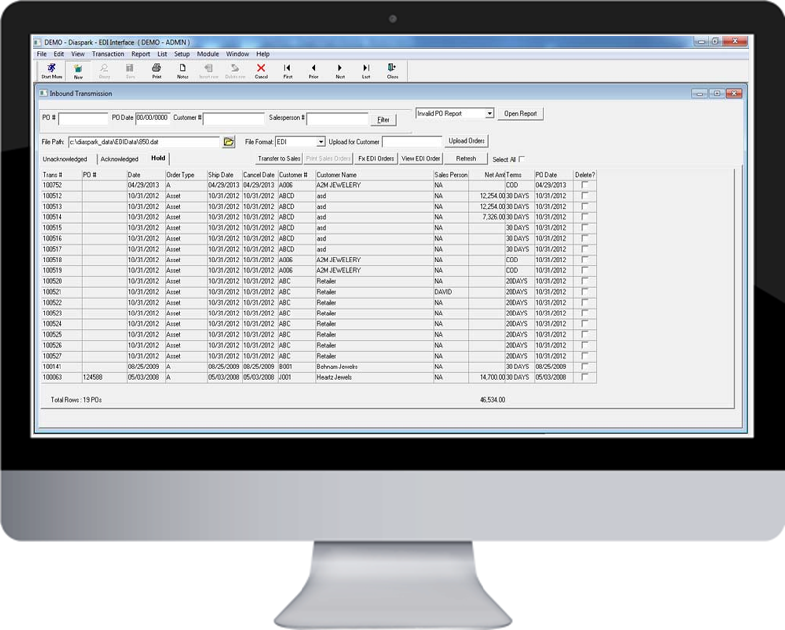 User can either receive the invoices from the sales module or enter invoices manually. The buyer can acknowledge receipt of invoice and its accuracy with this feature. It is a standard functional acknowledgement (997) made by the buyer on receipt of sales invoice through EDI.